Members of the Penobscot Valley girls softball team hoist the Class D North championship plaque following the team's 7-2 victory over Southern Aroostook in 10 innings Wednesday at Brewer High School. 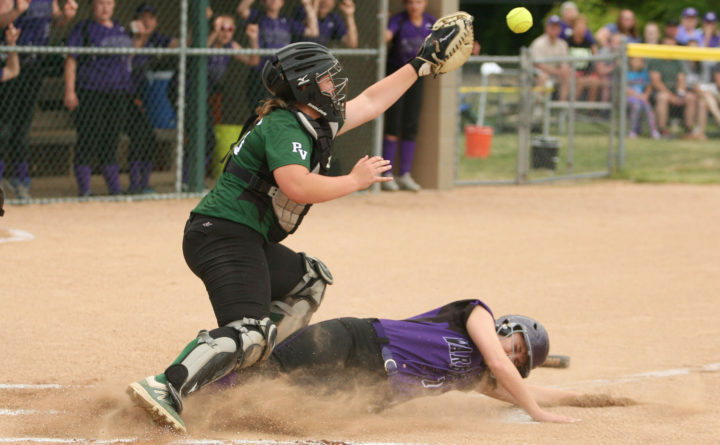 Southern Aroostook's Sydney Brewer slides safely home as Penobscot Valley Kortney McKechnie prepares to catch the throw home during Wednesday evening's Class D North championship at Brewer High School. 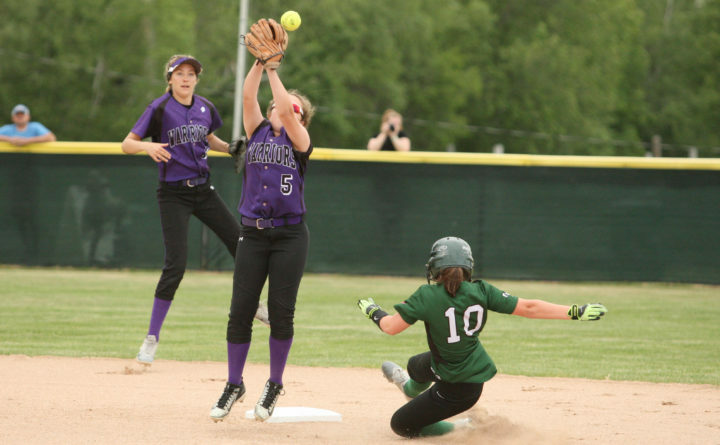 Southern Aroostook second baseman Paige Vose leaps into the air to catch the throw from home as Penobscot Valley's Emma Buck slides into the bag during Wednesday's Class D North championship in Brewer. 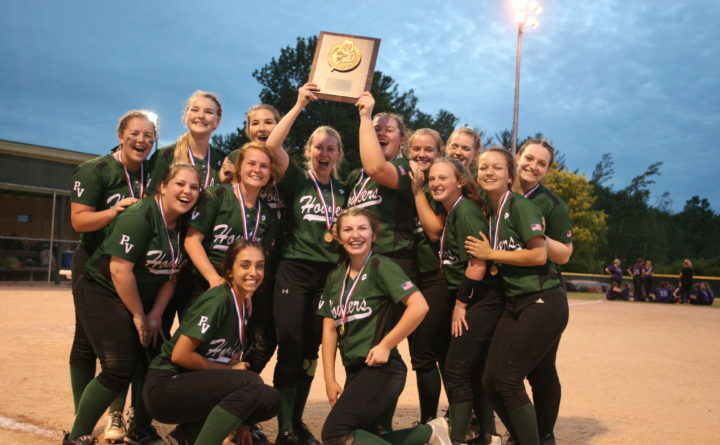 BREWER Maine — They played an eight-inning thriller a year ago in their Class D North softball championship game with Penobscot Valley High of Howland prevailing over Southern Aroostook of Dyer Brook en route to a state championship. This time, it went 10 innings and the Howlers again came out on top, 7-2. Second-seeded PVHS (19-0) scored five runs in the 10th inning to win their 39th consecutive game. Top seed Southern Aroostook wound up at 16-1. Penobscot Valley will now take on Class D South champ Greenville, 17-1, in Saturday’s state D championship game in Brewer. Game time is noon. It was a senior co-captain, shortstop Ryley Buck, who came through after having a forgettable game up to that point. Buck, who had struck out twice and fouled out in her three previous at-bats, delivered a run-scoring single to center to break the 2-2 tie and winning pitcher Leine McKechnie capped the rally with a long, opposite-field three-run homer to right. Erynn Williams opened the 10th by drawing a walk on a 3-2 pitch from right-hander Kylie Vining. Emma Buck, Ryley’s freshman sister, then blooped a single into left-center to put runners on first and second. After failing to put down a sacrifice bunt and falling behind 0-2 in the count, Buck ripped a sharp single to center to score Williams. One out later, Lexi Ireland drew a walk to load the bases and Morgan Banks delivered Emma Buck with a fielder’s choice to second. Sophomore McKechnie, who had struck out three times and walked, then belted the pitch way over the fence in right to sew up the win. “My coaches told me I had been trying to kill the ball,” said McKechnie, who heeded their advice and focused on just trying to hit the ball hard. McKechnie, who had struck out 19 and tossed a one-hitter in last year’s D North final, fired a three-hitter on Wednesday with 21 strikeouts and two walks. “I gained more confidence as the game went along,” said the hard-throwing McKechnie, who threw 136 pitches of which 91 were strikes. Southern Aroostook junior Vining also pitched a gem, allowing seven hits with 10 strikeouts and four walks. She threw 144 pitches of which 92 were strikes. “She’s a phenomenal pitcher,” said McKechnie of Vining. Southern Aroostook jumped in front 1-0 in the second inning on Sydney Brewer’s resounding opposite-field triple to the right-field fence and Kacy Daggett’s bunt single. The Howlers responded with a run in the top of the third on Emma Buck’s base hit, her stolen base and Ireland’s two-out ground-ball single to center. After Daggett’s bunt single, McKechnie retired 20 of the next 21 hitters including 16 via strikeout. The Howlers pushed across a ninth-inning run when Ireland drew a leadoff walk, the first walk of the game issued by Vining, moved to second on Banks’ sacrifice, stole third and scored on senior Kortney McKechnie’s sacrifice fly to right. But the Warriors rallied dramatically in the bottom of the ninth. Freshman Paige Vose drew a one-out walk and moved to second on a wild pitch. McKechnie struck out the next hitter but Vining rifled a 3-2 pitch into center field to score Vose and tie it up. She moved to second on the throw to the plate but Leine McKechnie got the next hitter to ground out to Buck at short. “I’ve never pitched a 10-inning game. The most I had pitched was the eight-inning game a year ago,” said Vining, who called McKechnie a great pitcher. Kortney McKechnie had two singles to go with her sacrifice fly, Emma Buck singled twice and Ireland walked twice to go with a single.